Aida Ali Akreyi is a researcher at AIR with a focus on postsecondary education. She has over six years of experience in higher education administration, primarily focusing on institutional research, assessment, evaluation, and strategic planning. 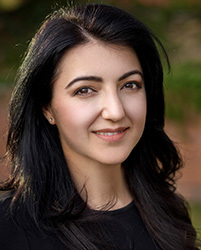 In her current position, Dr. Ali Akreyi works on the postsecondary administrative data division task of the Education Statistics Services Institute Network project. She directs survey instruments such as Fall Enrollment and 12-month Enrollment for the Integrated Postsecondary Education Data System at the National Center for Education Statistics. Prior to joining AIR, Dr. Ali Akreyi led an institutional research office at a private college in Southern California. Her research interests include higher education finance, governance, and management. Her research has been presented at national conferences, such as the Association for the Study of Higher Education, the Association for Education Finance and Policy, the American Educational Research Association, the Association for Institutional Research, and the Council for the Study of Community Colleges. Dr. Ali Akreyi’s dissertation was entitled Mismatch of Priorities: Financial Autonomy and Its Effect on Spending Patterns of Public Higher Education Institutions.